Unfortunately, my “to read” shelf is growing faster than I can clear my “currently reading” shelf. Busy with work and lot’s of travel have encroached on my reading time. But here are the books on my list, as usual a mix of business, personal interest and self-improvement. The Presence Process: A Healing Journey into Present Moment Awareness by Michael Brown. Recommended by family, always healthy I believe to have a self-awareness read in the queue. The Big Short: Inside the Doomsday Machine by Michael Lewis, the author of Liar’s Poker and The Blind Side. A close friend recommended this read which delves into the macrocosmic tale of greed and fear during the 2007/8 Wall Street crisis. Born to Run: A Hidden Tribe, Superathletes, and the Greatest Race the World Has Never Seen by Christopher McDougall. A personal journey into understanding ultra-distance running as a way of life, health and contentment among the Mexican Tarahumara tribe. My running life has become un-fun and too functional, so am looking for a little inspiration. Think and Grow Rich by Napoleon Hill. This book was written nearly 75 years ago now as a philosophical approach to living life and interacting with our fellowman, conceived through research and personal interviews of leaders of that time – Ford, Edison, Rockefeller, Graham Bell and 500 others. Little Bets: How Breakthrough Ideas Emerge from Small Discoveries by Peter Sims (@petersims). Sims is an entrepreneur, VC and author of True North. His research contends that many of the most successful companies and individuals did not result from some genius idea, but rather through a masterful approach to experimentation and learning. Excited to read this one, it has just recently been released. Do More Faster: TechStars Lessons to Accelerate your Startup by Brad Feld (@bfeld) and David Cohen (@davidcohen). TechStars is a successful startup accelerator operating in several U.S. cities co-founded by Feld and Cohen. I follow both actively through Twitter and their individual blogs and have met Brad recently. I need to find a way to carve out more reading time before this list gets out of hand! I wanted to follow up a prior post on my favorite startup blogs with a post on a handful of my favorite Twitter follows. These are a group of folks, most of whom I only know by reputation, that have something to say or news to share about technology, startups or entertainment. As I mentioned previously, Twitter has become a go-to source of news and insights for me, an incredibly efficient way to absorb a lot of information quickly. Enjoy! @TechCrunch – the leading startup blog, news feed. Good iPhone app too. @Oxfam – An international group of 15 organizations across the world developing solutions for poverty & injustice. @bfeld – Brad Feld, VC and prolific blogger, highlighted in a prior post. Highly active on Twitter. @msuster – Mark Suster, Entrepreneur turned VC, very active blogger and on Twitter. @sacca – Chris Sacca, Entrepreneur and early investor in Twitter. Highly active. @tferriss – Tim Ferriss, author of “4-Hour Work Week” and “4-Hour Body”. Interesting and unique. @fredwilson – Highly regarded VC and daily blogger. @cdixon – Chris Dixon, entrepreneur founder of Hunch. @davemcclure – Founder of 500startups, a seed fund and startup accelerator. @hnshah – Hiten Shah, Co-Founder of KissMetrics, great insights for entrepreneurs. @bhorowitz – Ben Horowitz, Founder of LoudCloud turned VC. Phenomenal blog that I inadvertently left off my previous post. @SudsNYC – Sudhir Kandula, a friend and top 3 finalist in “America’s Next Great Restaurant”. @playgrounddad – Connecting modern dads with products/events that help them spend better time with their kids. @StartupJesus – Fake Jesus, runs a startup that is “going to change the world”. Of course it will. @ConanOBrien – love his humor and his show. @BorowitzReport – Andy Borowitz, hilarious quips on current events. King of the one-liners. @bobsaget – ever since he appeared on Entourage, I can’t get enough of him. @shitmydadsays – Justin who lives with his 74-year old dad. 4-letter word alert, but freakin’ funny. What are some great Twitter follows that I missed? I didn’t. Never really thought emergency preparedness until it came up in a discussion group of media, entertainment and technology executives I’m involved with here in Los Angeles. And as an expecting father I became particularly interested in this topic (and others). An irrational and emotional response? Maybe. But keep in mind I live in Santa Monica in the greater Los Angeles area, the epicenter for speculation and concern regarding “The Big One” earthquake that will originate on the San Andreas Fault someday. In fact, the USGS has a downright scary simulation of the 7.8 Big One that originates on the fault line and fans out to the coast and right up my driveway. To give you perspective, a 7.8 earthquake involves ground movement of 3ft laterally and “shaking” at 1ft/second. Crazy. The email discussion thread started out rational enough among the group – if you want to be prepared for a natural disaster, there is lot’s of guidance out there on what to include in your home or auto kits, sources for purchasing supplies, recommendations on what to do when a disaster hits and there’s no road or phone access, etc. 1) Emergency preparedness is based on irrational exuberance, that statistically speaking and from a cost/benefit standpoint, is a waste of time and money, even if you live in Southern California, Southeast Asia, Japan or Florida where adverse natural events tend to occur. Add up the cost for every human to have a “kit”, then factor in the economic benefit of lives saved and if the number is negative, it is irrational. 2) Basic survival kits for home, auto and “on the go” are no-brainers. These include food, water, first aid and other survival gear along with a “family plan” of where to meet should roads and phones be inaccessible. 3) “Extreme” (my word) Emergency Preparedness which advocates for all of the items in #2 in addition to retaining firearms in the home and auto in anticipation of possible riots, theft and personal attack by those who were not prepared. In some cases, underground bunkers are installed and stocked with supplies. After taking in all the data, I fall squarely in the camp of #2, based primarily on where I live. I’ve just ordered basic kits for home and auto, but personally I’m not a big fan of having a firearm in the house, just my personal preference. Renee and I are working out a simple “meet up” plan should we not be able to use our cell phones or our cars. We’re talking a hundred bucks and a few minutes of time all in here. Seems like a reasonable cost/benefit to me. Do you have a disaster kit or plan? What’s in it? On Monday Renee and I went for our non-medical, baby-in-the-belly-for-entertainment 4D ultrasound. 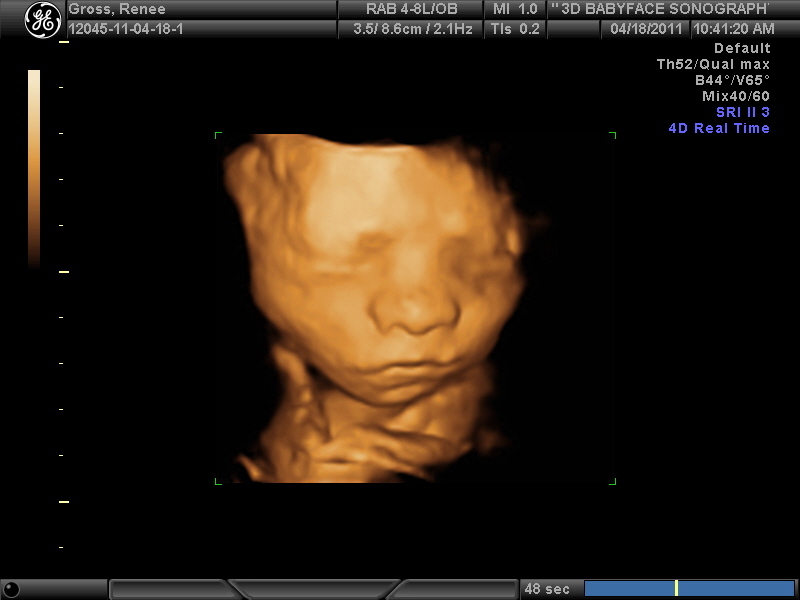 This procedure is where they use a skin-level view imaging system in combination with the ultrasound to give 3D views of your unborn child plus movement (thus the 4D). We spent about an hour with the technician poking, prodding and moving Renee into various positions to give us the most non-creepy view possible of our little one. It was wonderful and creepy at the same time as evidenced by the picture. 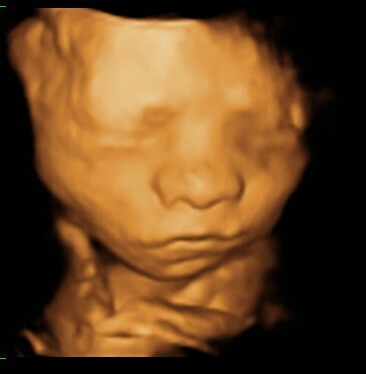 Renee’s family will be happy to know that Baby G has her nose and mouth!